I was up a 7:00 and called the Wilson lockmaster to see when we could go up. She said she could take us in 3 hours but we should head over in 2 hours. We got there at 10:30 and were finally through at 11:30. A total of 4.5 hours with about 1 hour drifting around. It is just 5 miles to Turtle Point. This is a private club and a good friend from Nashville made the arrangements for us to stay here. 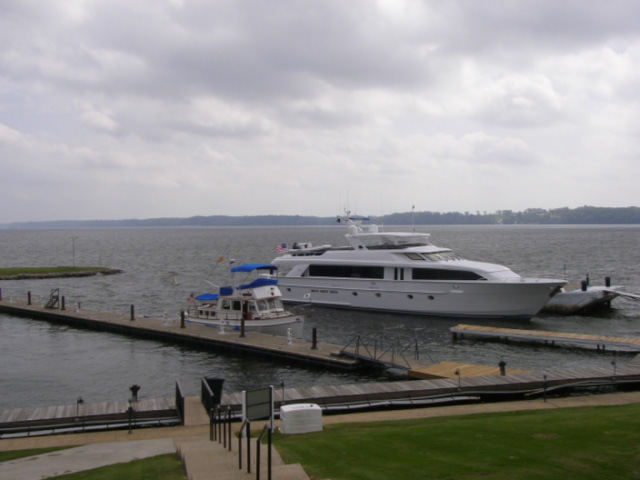 We docked beside another hugh yacht (see photo). This one called "Freedom" belongs to the man that founded "Books A Million". Renting a car turned out to be a challenge with the first vehicle a panel truck with only two seats so Mavis couldn't go back to the office with the driver and myself. Then I had to wait while they washed a car that had just been returned and drive back to Turtle Point to pick up Mavis. It was raining very hard when I got back and she could not see that I was there. Anyway, we drove back into town, toured Sheffield (mostly pretty grim), went to the W.C. Handy house (closed 10 minutes before we got there), had ice cream at a 1918 shop called Trowbridges, and then visited the spectacular new Marriott conference center. The tower contains a spa and revolving restaurant. The view is magnificent and looks up and down the river for miles. Please note all photos can be enlarged by clicking on them.